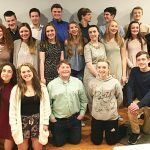 Rockford Ski Teams Take to the Slopes! 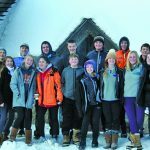 In early January, Rockford racers attended their annual “Christmas Camp” at Boyne Mountain in preparation for this season’s rigorous high school race schedule. Coach Ashleigh Stewart had her teams practicing both Slalom and Giant Slalom courses in morning and afternoon sessions for 3 days. While temperatures reached well into the negative range, the snow condition was excellent, and the crowds were minimal. The racers enjoyed camaraderie, dinners out on the town, and evening activities such as Laser Tag! The hard work and fun proved to pay off nicely as Rockford “came out of the gate” full steam ahead in January’s races! 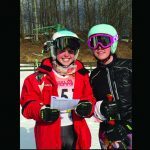 All races in January took place at Cannonsburg on Tuesday and Thursday nights, except one Varsity race on Friday, January 26th, which was held at Caberfae Peaks in Cadillac. Rupert has been a consistent top finisher in the field for the Ram Team. 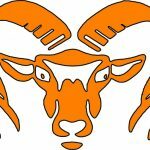 Rockford’s Junior standout, Karsen Ford has been a consistent top finisher in the field for the Ram Team. The February schedule will include a Varsity/JV race at 4:30 on the 6th (Senior Night), Regionals on the 12th, and State Finals on the 26th. Good Luck to all our fearless racers!